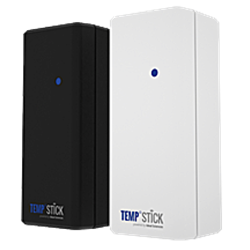 The Temp Stick WiFi powered smart monitor sends alerts to your phone or email the instant an important change in temperature or humidity is triggered. You set the trigger points and alerts. View and update from anywhere... anytime! Sends text and email alerts. Check-in from mobile, tablet or pc anywhere, anytime. Data logging with unlimited history. No subscription or fees! Dimensions: 3.5" x 1.5" x 1.25"
0 to 100% RH operating range.